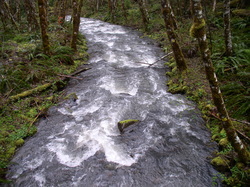 Climate change has important implications for management of fresh water resources. While some parts of the world are expected to become drier, the highlands region in the central Appalachians Mtns. is expected to wet up. This is because warmer air holds more water. The theoretical basis for this intensification of the water cycle is based on a relationship that implies specific humidity will increase exponentially with temperature. The implications of this intensification are immense: change in the regional water cycle may lead to changes in the frequency and intensity of storms, floods, and droughts. Recent (& preliminary) modeling work conducted by the Mountain Hydrology Laboratory estimates runoff increasing by 40% over the next century having important implications for contaminant fate and transport, water treatment, ecosystem services, and the suitability of civil infrastructure to accommodate future changes in hydrology. See PROJECTS for more information. Surface mining for coal is one the greatest drivers of land cover changes in the Central Appalachian Mountains region of the eastern US. Mountaintop Removal Mining (MTM) is a special form of surface mining that removes forests, soil, and overlying bedrock using explosives and heavy machinery to gain access to deeper coal seams. MTM produces more waste than can be stored on the mined area so excess overburden is cast into adjacent valleys creating valley fills that often completely bury headwater streams. In 2010 we established a small catchment study funded by NSF, Oak Ridge Associated Universities, and internal research funds to compare streamflow generation processes in an undisturbed forested catchment and a MTM-impacted headwater catchment. In addition to isotope hydrology, we are using hydrologic models to characterize storm-scale responses to the landscape-scale disturbance. See PROJECTS for more information. While the Central Appalachian Mountains region boasts a long history of oil and gas development using conventional (vertical) methods, the arrival of unconventional horizontal hydraulic fracturing (fracking) methods from the Texas oilfields has opened up the Marcellus Shale gas play to development. This form of gas drilling uses approximately 2-8 billion gallons of water per fracking operation (& wells can be fracked a few times a year) though recent advances in water recycling technologies and use of mine drainage are reducing the amount of freshwater needed. The Mountain Hydrology Lab is collaborating with USFS scientist at the Fernow Experimental Forest to establish baseline chemistry for shallow groundwater and surface water using carbon and radium isotopes and geochemistry throughout the Monongahela. We are also interested in characterizing the effects of fragmentation on water balance components and water quality. See PROJECTS for more information.